The process of mixing of atomic orbitals of nearly same energy to produce a set of entirely new orbitals of equivalent energy (hybrid orbitals) is known as hybridization. Atomic orbitals of almost the same energy belonging to the same atom or ion can take part in hybridization.. The number of hybrid orbitals formed is always equal to the number of atomic orbitals taking part in hybridization. The hybrid orbitals repel each other and tend to be farthest apart. 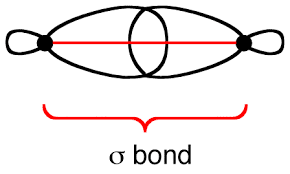 Hybrid orbitals forms only sigma(σ bonds) σ and pi bonds( π bonds )are formed by unhybridised orbitals. Sigma bond: This type of covalent bond is formed by the axial or end to end overlapping of half filled atomic orbitals of the atoms participating in bonding. The electron cloud formed as a result of axial overlap is cylindrically symmetrical about inter nuclear axis. Pi bond: This type of bond is formed by lateral or side wise overlap of the half filled atomic orbitals of the atoms participating in bonding. The pi bond consists of two charged clods above and below the plane of the atoms involved in bond formation. 1. The covalent bond formed by the overlap of atomic orbitals along the internuclear axis is called sigma bond. 2. The overlapping orbitals are oriented along the internuclear axis. 4. A as well as p orbitals can form this type of bonds. 6. A single bond contains only one sigma bond while multiple bonds like double bond contain only one sigma bond. 8. It is stronger than a pi bond. 1. The covalent bond formed by the lateral overlap of two p orbitals which are mutually parallel but oriented perpendicular to the internuclear axis is called a pi bond. 2. The overlapping orbitals are oriented perpendicular to the inter nuclear axis. 3. The bond is not rotationally symmetrical around the internuclear axis. 4. Only p orbitals can form this bond. 5. It decide the length of the molecule. 6. In the case of the pi bond a single bond contains only one pi bond, whereas multiple bonds like double bond have two pi bonds and triple bond has three pi bonds. 7. pi bonds are formed additional to sigma bond and not having independent existence. 8. It is weaker than a sigma bond. I can guarantee tons of students are using this to help in their understanding. This is really A GOOD site. Many students can clear their doubts here..
And they get many things on this site..